back theria: A Rumpus Without Books? Upon walking through a Barnes and Noble store, I looked around and sighed, thinking, "In ten years this book store will no longer exist as we know it today." My thoughts were partially confirmed when I read the Sunday NYTimes. "Leaving the Pictures Behind" appeared in the Week in Review section. The three-sentence piece caught my eye. Here are those three sentences. "Picture books are failing. Publishers, it was reported last week, have cut down on the number of new titles, and sales are suffering. Blame the recession, but also the increasing pressure on preschoolers to read chapter books. 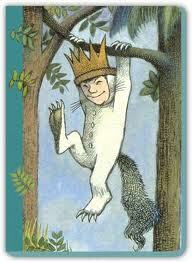 Just imagine: Max is being told to put away his yellow-eyed monsters in 'Where the Wild Things Are.' Seems worth a wild rumpus."